For Top-Flight Animators, The Gag Is An Art All Its Own In movies like Toy Story, Despicable Me and the new fairy tale Frozen, elaborate sight gags are critical to the cartoon humor. And the process of getting the laughs from storyboard to screen is more complicated than you might think. The Gag's The Thing: Olaf the snowman has all kinds of nose trouble — and not just sniffles — in Disney's animated musical Frozen. This storyboard image is an animator's early notion of how the visual joke might play out. After a long process, the gag from the storyboard has become colored, computer-animated reality in the final film. 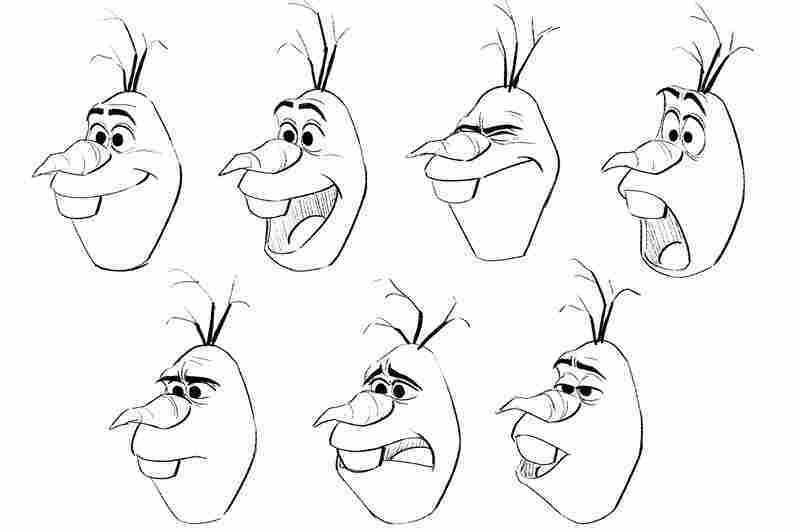 Disney's animators took playful advantage of the unique physical qualities that might affect — maybe even afflict — a sentient snowman, reconfiguring his body at whim. Actor Josh Gad, who voiced Olaf, was tasked with providing a broad range of sounds — some of them quite unmusical — to accompany the various scrapes the snowman gets himself into. When the Frozen filmmakers realized that one thing a hapless snowman and a hungry reindeer might have in common is an affinity for carrots, a decidedly pointed gag was born. And in animation, the sky's the limit. Laws of gravity need not apply. In Finding Nemo, a huge pelican swoops through a window into a dentist's office, flapping all over the place and knocking over the instrument table. In Despicable Me, one of Gru's millions of yellow minions cheerfully ping-pongs another who's hooked to the end of a fishing line. For big studio features, hundreds of people spend their days figuring out how to manufacture this sort of silliness from the ground up. But that's the thing: They're starting from scratch. So where do they go for visual inspiration? 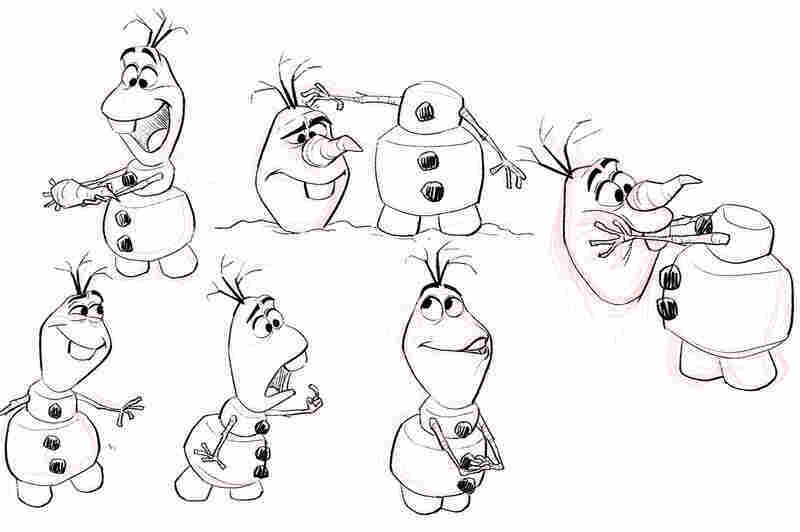 Chris Buck, co-director of Disney's latest animated adventure, Frozen, used to teach animation at Cal Arts. He says he'd tell his students to go out into the world and "just become a fantastic observer of people, animals, everything" — how they're built, how they bend, how their bodies move when they trip. With that grounding, animators can be free to exaggerate, to play fast and loose with cause and effect. But they always try to make what they're portraying somehow believable — because above all, the best animation conveys emotion. Likewise, the pros say the best animated gags are the character-driven ones — think of the sequence in Toy Story where the little arcade-game aliens foil Woody's attempt to save Buzz from vicious kid Sid because they worship the all-powerful Claw — because what makes them funny is not just the action, but the reaction too. Walt Disney himself once said that the medium never really hit its stride "until we had more than tricks ... until we developed personalities." Dean Deblois, who co-directed DreamWorks' How to Train Your Dragon, says sometimes a really great comic sequence takes a team of animators coming together for a gag session. "We say, 'Here's the movie, how can we make it 10 percent funnier? What if you did this?' "
Jimmy Hayward, who recently directed Free Birds, learned a valuable lesson when he was just getting started as an animator. One of his first jobs was on Toy Story. "These toys were actually trying to kill each other," he remembers realizing. "They're like throwing each other out of windows and off moving trucks into the jaws of dogs. I remember thinking, 'Wow, where there's great conflict and great peril, there's great room for comedy.' "
There's certainly some great peril in Frozen. Co-director Jennifer Lee says that for a teaser trailer, filmmakers wanted to find a clever way to introduce the oddly adorable snowman, Olaf, to the goofy-looking reindeer, Sven. So they had a gag session. "We were having these big philosophical conversations about what do a reindeer and a snowman have in common," she says. "And the thing we just got to is, 'Well, they both like carrots.' "
Think about it: Some of the most respected minds in animation figured out not only that a snowman and a reindeer might both be interested in carrots — one for smelling the flowers with, one for a snack — but that the presence of just one carrot in a scene between them could cause great comic-dramatic tension. The resulting gag became the anchor for that teaser. The animators had a field day with Olaf. The snowman uses one of his twig arms to catapult himself across the ice. When he falls off a cliff, the snowballs that form his body rearrange themselves in midair. 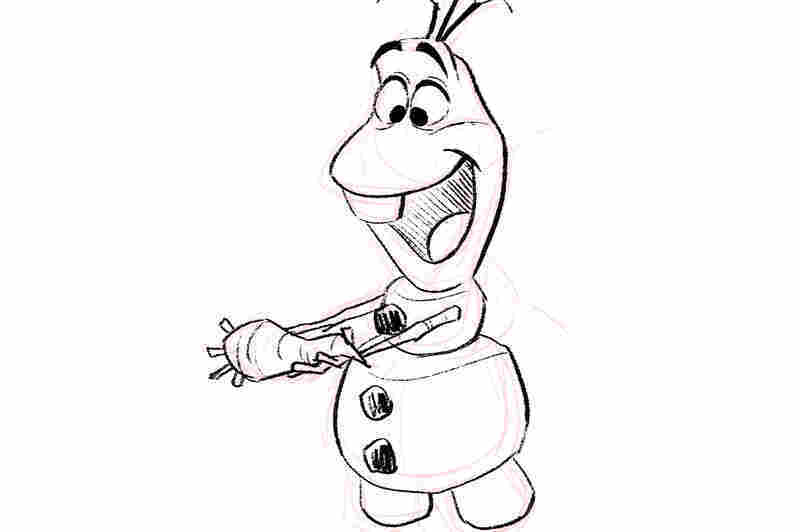 Olaf is voiced by actor Josh Gad, who says he got a charge out of how animators took full advantage of the fact that Olaf is made of snow. "What does snow do? It builds on itself," Gad says. "It can melt. There's so many opportunities for this character to add or subtract mass, and I think that became part of the unique comedy in the film." Gad, who's done live theater, TV sitcoms and feature films, says voicing gags is a unique process. "There's a page of different sounds that the human body shouldn't make, that they wanted me to do over and over again," he says. It was, the famously funny Book of Mormon veteran says, "a liberating feeling."